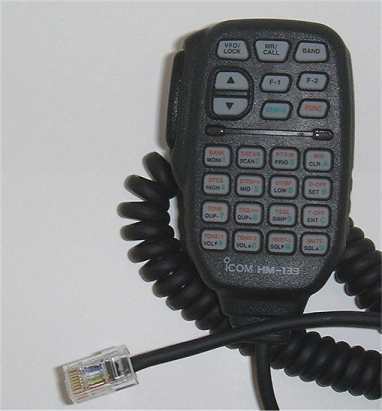 The Icom HM-133 PTT switch is notorious for not working properly. For the most part, I’ve had good luck with mine. However, the mic on my Icom IC-2200H started to act up on me. I think I may have found the fix. Okay, the first thing to do is take the two screws off the back of the mic. After working the black plastic off, lightly jiggle the long thumb piece of the PTT button. You’ll see a little grey rubber piece that fits on the PTT switch. Take the grey rubber piece off. You’ll see the red stem that has to be pushed in by the grey rubber piece. Here’s the problem. The grey rubber piece just doesn’t extend in far enough to fully trigger the red stem. So what is needed is a buffer to fit in between. A piece of rubber band may work. What worked best for me was a small chunk of an eraser that came off a pencil. You’ll have to whittle a piece of the eraser until it is right. It might take a couple of times to get the right fit. After putting it all back together, the microphone functions properly if one can keep the eraser centered on the stem. If not, the microphone will not transmit accurately. If you’re having problems with the Icom HM-133 microphone, try this quick fix. The pencil eraser makes a good buffer. I tried it with great results so far. Final Note: If you tried this and the microphone still didn’t perform like it should, let it set for several months up to a year (sounds insane I know). The pencil eraser may eventually shape itself with time. I let mine set and now it works! Don’t throw the mic away. Patience is always best. and made frome where these mic ? It’s awesome to pay a visit this website and reading the views of all friends about this piece of writing, while I am also zealous of getting familiarity.